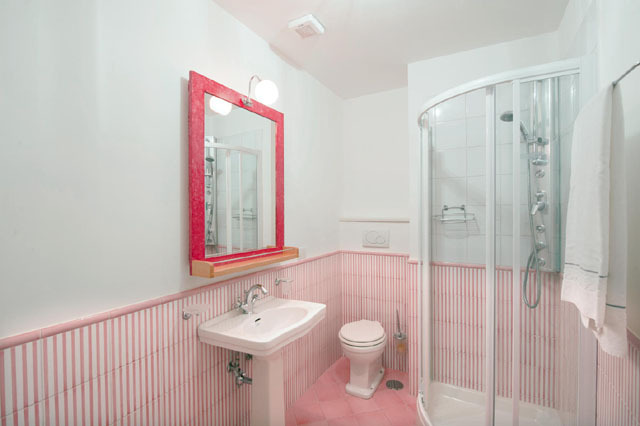 Air Conditioning, Internet Wireless, TVSAT 32”, dishwasher, microwave, washing machine. 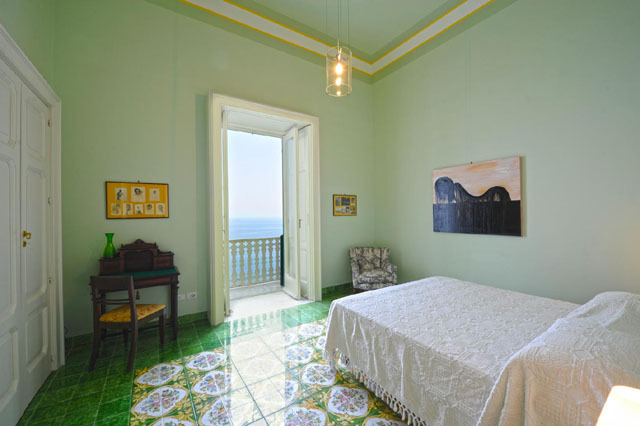 An historic villa in Amalfi which is detailed in the famous book on the Costiera Amalfitana ~ entitled ‘Costa delle Sirene’ published in 1867. 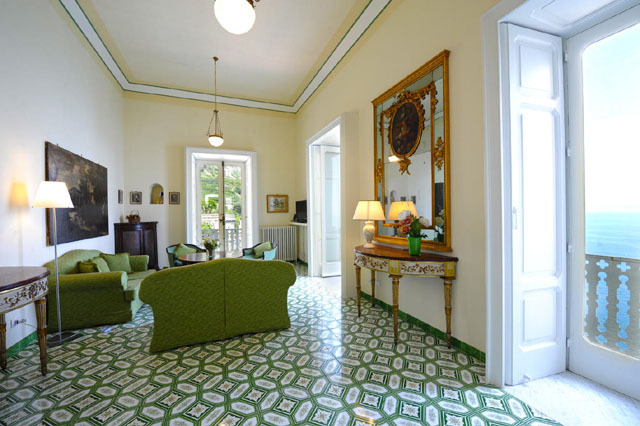 In Amalfi, the people refer to the villa as the "Palace" and was purchased in 1943 by the Marquis Francesco Mottola of Amato. 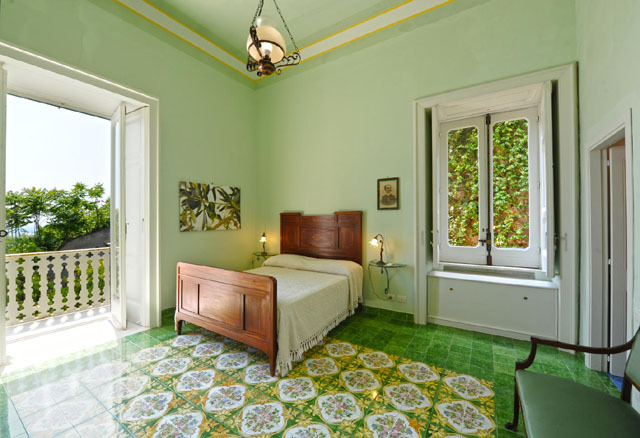 Renovated by the heirs which sought to emphasize the architectural beauty of the villa, the airiness of the rooms, and to delight the senses by planning an exquisite garden. In 2004 the villa was declared a "monument of national interest" by the Ministry of Culture. 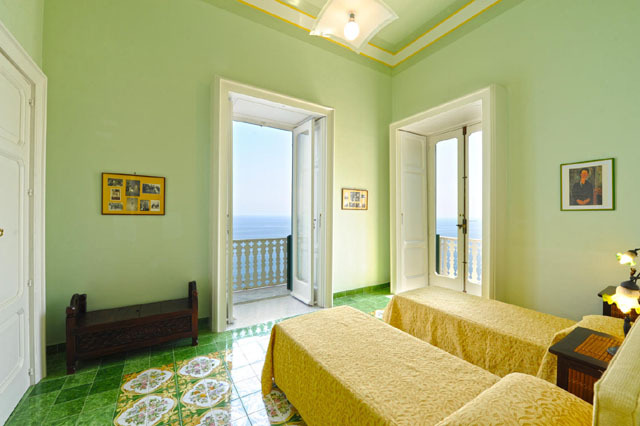 It stands on the western side of Amalfi, along the road to Positano, immediately after the luxurious Hotel Santa Caterina. It has a privileged location with a feast of astounding views. 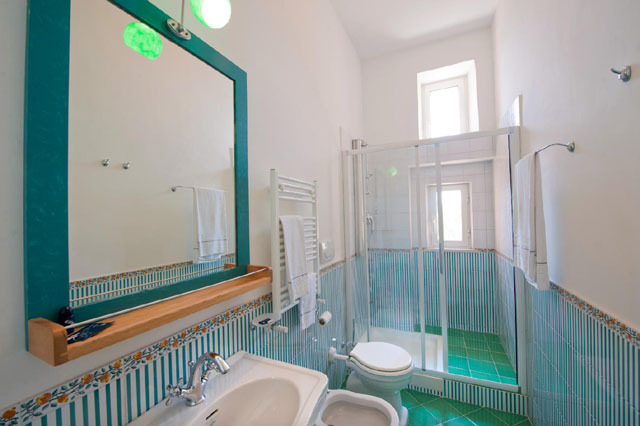 The villa is situated 200 meters from the beautiful beach of Duoglio (Lido degli Artisti), which can be accessed via a spectacular descent of steps or by one of many boats that leave from the harbor (10/15 minutes walk from the Villa). 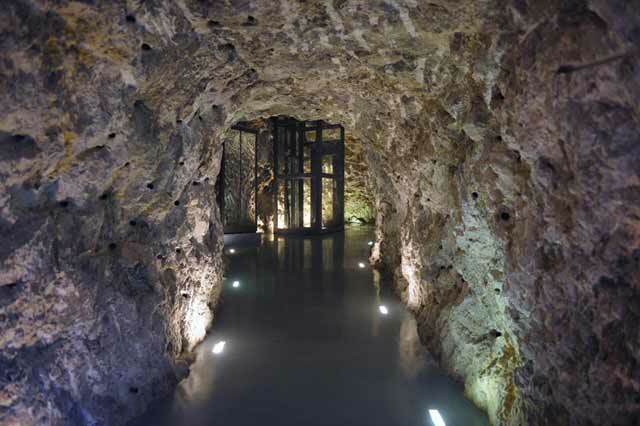 The villa is equipped with all modern comforts, yet retains its elegant aristocratic character, including the fascinating cave that gives access to the elevator. The spacious interiors and the striking views of the apartments can be enjoyed in all seasons. 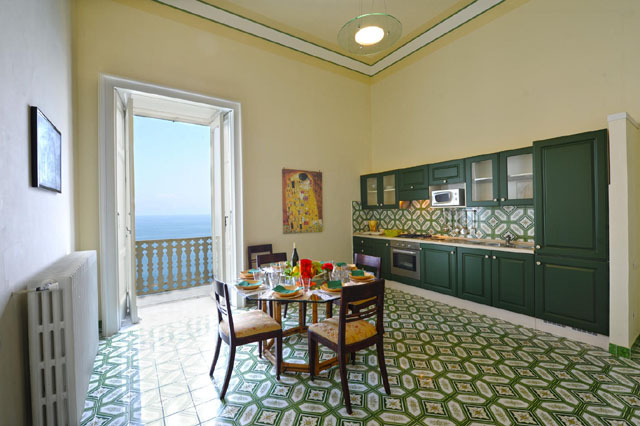 It is close to many outstanding villages, historic sites and locations ( Ravello, Positano, Emerald Grotto, Paestum, Pompeii, Capri, etc..), offers access to the great cities of of Naples and Salerno, and is ideally situated to enjoy the many attractions and events that the Amalfi Coast can offer. 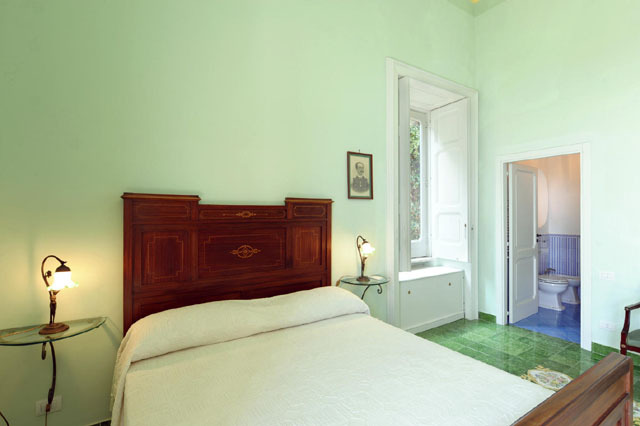 The villa can be accessed via two entrances: one on the main road using the elevator and the second situated at the top on the property, which opens onto a pedestrian street. is located on the third floor of the building. 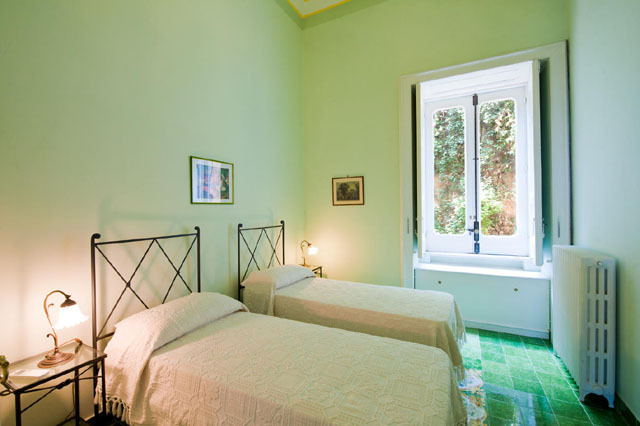 It is a large and prestigious apartment where the yellow and green stand out in the spacious living and the bedrooms; beautiful floors with floral motifs and lozenges. Even the unusual railings of the balconies is further striking decorative element. 1km Amalfi, Atrani 1.5 Km, 3Km Conca dei Marini, Furore 8km, 9km Praiano, Positano 17Km, 32Km Sorrento, Ravello 7km; Minor 5Km; 6Km Maiori. Salerno and train station 26Km.